Sightseeing and outdoor adventures are what Zion National Park is all about. Whether you have only a couple of hours to drive through the park or several days to explore it in more detail, there are some highlights you simply shouldn’t miss. The main attractions in Zion are the sites along the Zion Canyon Scenic Drive and the Zion-Mount Carmel Highway. If you’re looking for things to do, you’ll find hiking trails for all abilities; opportunities for horseback riding; and for the more adventurous, canyoneering and rock climbing. To learn about the people who have inhabited this region over the centuries, be sure to stop in at the Human History Museum. 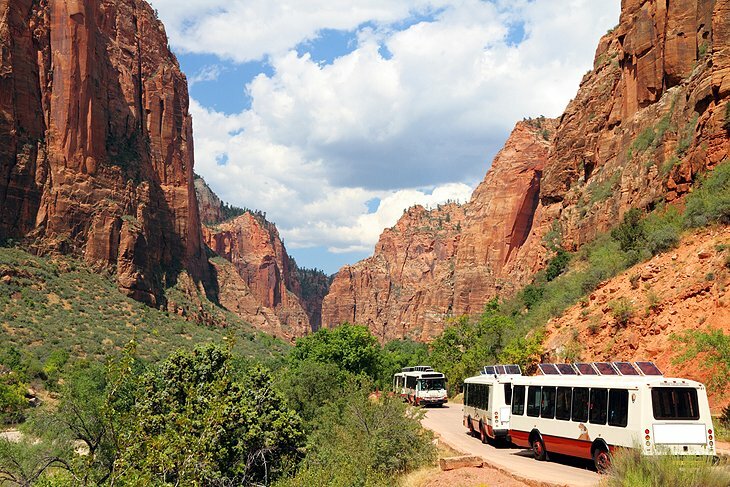 From mid-March to late November a free shuttle bus system operates within Zion National Park and from the town of Springdale to the park. The shuttle buses within Zion take tourists to stops along the Zion Canyon Scenic Drive, and cars are not permitted along this stretch during these months. The most dramatic section of Zion National Park is Zion Canyon, accessed along the Zion Canyon Scenic Drive, an in-and-out road that runs along the canyon floor, with towering cliff walls on both sides. This road offers views of some of the most famous sites in the park, including a view up to Angels Landing, and dead ends at the start of one of the park’s signature features, the Narrows. It is also where many of the park’s key attractions are found. The park’s shuttle bus, which allows you to hop off at the scenic sites and hiking trailheads along the way, offers a hassle-free way to explore this area. You can also bike this route. Shuttle buses are equipped with bicycle racks. In winter, when the shuttle bus is not operating, you can drive this route in your own vehicle.